Orange is the new red when it comes to lipstick these days. People are getting bolder and bolder with lip color — Boston Calling performer Lorde opts for darker-than-dark shades — and it’s a phenomenal way to make a statement. Allure noted in its September issue that orange is one of the biggest trends in makeup right now, and it’s a fun option to brighten any outfit. The brighter, the better, in fact. I own way too many tubes of lipsticks — my makeup bag doesn’t zip, but I pretty much buy a tube of lipstick every time I walk into a drug store. It’s a problem. And I don’t shy away from bright or even neon colors (I’m obsessed with Maybelline’s Color Sensational Vivids line, especially the Hot Plum and Fuschia Flash shades). But admittedly, my first time trying out orange lipstick made me cringe a little when I looked in the mirror. The Wet n’ Wild Carrot Gold is much more orange on the lip than it looks in the tube. It’s a tough shade to wear comfortably. I applied some classic L’Oreal Colour Riche in British Red over the top to tone down the harshness. Slowly, though, I’ve been wearing purer oranges with less red. Baby steps, right? Be careful of wearing pure orange lips with an all-black outfit, though — unless it’s Halloween, of course. Opt for redder oranges or corals in these situations. Orange looks awesome, however, with outfits in blue, plum or white. Orange lipstick is a great way to keep summer alive as the weather cools off heading into this fall. 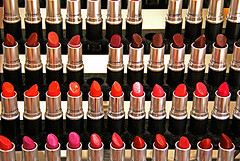 Don’t be afraid to be bold: daring lip colors are an easy and cost-efficient way to be fashion-forward.